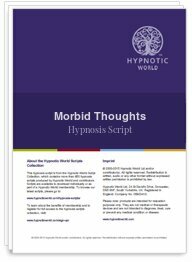 This script is intended to be used with clients who are constantly thinking of death or suicide, whilst realizing that they will never actually attempt suicide. If you suspect that your client is suicidal you should safeguard yourself by following any recommendations offered by your training establishment. The script will help your client to cast those morbid thoughts out of their mind and in the process, become calmer and more optimistic about their future.